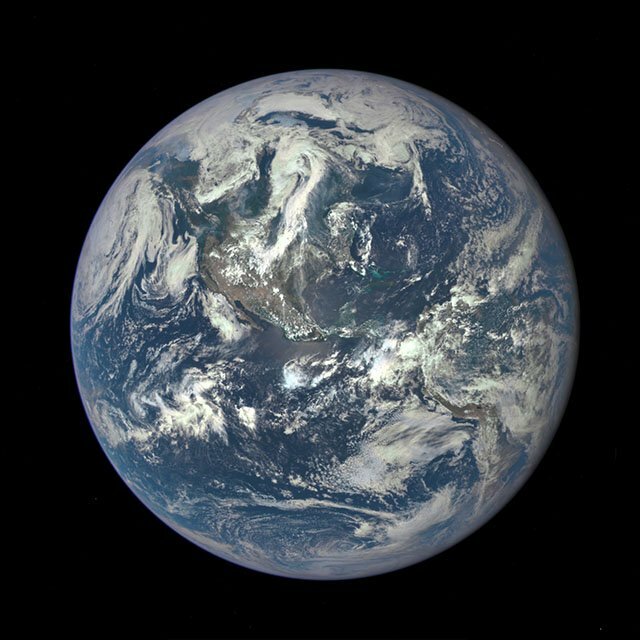 NASA�s new Deep Space Climate Observatory Satellite (DSCOVR) has captured its first photo (shown above) of our planet from one million miles away. By comparison, the similar and iconic Blue Marble photo captured by the crew of the Apollo 17 was just 28,000 miles away when that picture was snapped in 1972. At a distance of 1 million miles, every picture captured by DSCOVR actually shows what happened on Earth 5 seconds in the past, since that�s how long it takes light to travel from Earth to the camera. That camera is the Earth Polychromatic Imaging Camera (EPIC), which packs a four-megapixel CCD sensor and an 11.8-inch telescope lens with a field of view of 0.61�. The sensor is black-and-white, and there are 10 different filters that can be rotated into position depending on the desired wavelength of light. A photo of the EPIC camera found on DSCOVR. DSCOVR is at the special Sun-Earth L1 Lagrangian point, which ensures that it will always stay between Earth and the Sun. This means the EPIC camera will be pointed at the sunny side of Earth at all times. The L1 point. Illustration by Xander89/Wikimedia. The purpose of DSCOVR is to monitor solar wind for space weather alerts and forecasts. Once all systems are in full gear, DSCOVR will be snapping photos of the entire planet every two hours. Starting in September 2015, the photos will be regularly posted to an online gallery dedicated to the shots.